PlayStation Classic launches today! And it us wistfully strolling down memory (card) lane. Many of the 20 titles preloaded onto the miniature console not only changed the medium forever, but impacted each of us as gamers. Everybody comes to the table with a different beloved pick from the legendary lineup, and swapping memories is almost as fun as jumping back into these classics. Join us as we reflect on our favorites from that defining era. We want to hear your top PS Classic picks, too! Vote for your favorite game via the poll below, and share your own 480i memories in the comments. Having grown up on Tetris and spent much of my adolescent years in various arcades, Super Puzzle Fighter II Turbo will forever be one of my personal all-time classics. Piecing together giant super-blocks and planning ahead to build out the perfect game-winning chain attack is a refreshing change of pace from the “get rid of everything” mindset most puzzle games face players with. And having that massive chain interrupted by a particularly pesky garbage dump from your opponent can end a friendship in an instant — the mark of a truly great competitive puzzler. As someone who had spent most of their childhood playing light-hearted platformers on other peoples’ consoles, getting my own original PlayStation and starting Metal Gear Solid felt like graduating to the big leagues. Nothing could prepare me for how deep I would fall into the world of Solid Snake and his cardboard box disguises. The story felt more compelling than any game I had ever played up until that point, and I absolutely trace my love of stealth-action games to the hours I spent playing this. First time I was introduced to Capcom’s trend-setting horror, I lost most of a weekend. And, for a time, some friends as well. I’d been invited round to a pal’s for a catch-up but spent a day and night locked in a corner in front of the TV, mute but for the occasional yelp of fear as I explored Spencer mansion. They hadn’t a memory card, so every death meant a full restart. I didn’t care. RE was unlike anything I’d played before. It was a game worth falling out (albeit briefly) with a friend for. A lot of gamers will be familiar with Abe’s first outing thanks to the classic Demo Disc that came with the original PlayStation, but the full game had so much to offer: strategy, stealth, puzzles, and flatulence jokes made up one of the most intriguing and, in my opinion, memorable experiences of the generation. I played it again and again, and even revisited it recently with the modern reimagining on PS4. This was the apex of Namco’s iconic arcade racing series and, for my money, the best arcade racer on the console. Brilliant course design (I instinctively leant into every corner, leant back for every sharp rise) gorgeous visuals (that painterly reproduction of soft, early morning light in some races in particular). And that soundtrack: a sublime fusion of jazz, soul and funk (it’s still on my iPhone to this day). 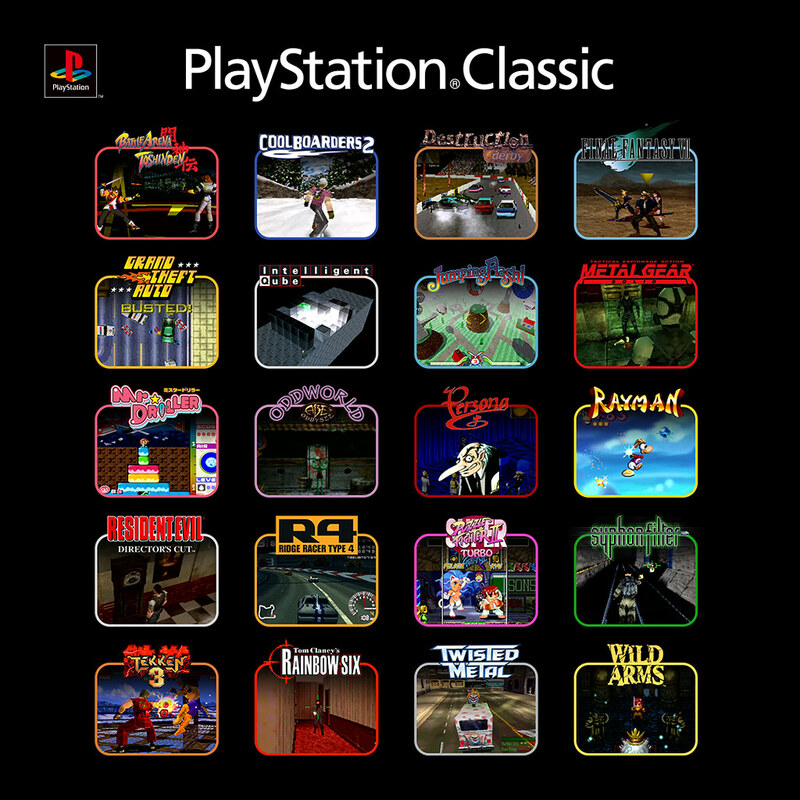 Which PlayStation Classic Game Will You Play First? What I want to know is why is the game lineup so underwhelming and why are there PAL versions on here? It makes no sense to use interior versions of games. Also, saying “preloaded” is very misleading because it implies we can add more. Pre-loaded and loaded mean and imply the same thing. The games come installed on the system. Neither term comments on whether games can be added later. They couldn’t get the copyrights to the versions that work on any reasonable TV that’s been made in the last 15 years, so they went with what they had. I’m sure, if you asked them, they’d tell you you were lucky to be playing any of these games legally at all. Hey get a USB keyboard hit escape and change the version to NTSC. I wouldn’t touch anything else if you dont know what you’re doing. It has nothing to do with copyrights it’s just a setting. I’m underwhelmed. So, I’m going to keep playing PS4 games. The fact that there are PAL versions of games on here alone makes this garbage. If you do a PS2 Classic, I sure hope you take feedback seriously and don’t repeat the same mistakes you made on here. I hope Sony takes a mulligan on this and releases an updated model featuring all NSTC version games and a better lineup. Maybe base it on a later edition of the system packaged with a dual shock. Maybe put an sd card slot in it and give us access to PSN to download the digital versions of PS games we already bought for the PS3/PSP/Vita/PSTV. That stuff is never going to happen. Frankly, it doesn’t need to. That is way too complicated for this kind of “mini-console”. Honestly, all Sony needed to do was to properly execute their original “classic console” idea. Meaning use NTSC games and most importantly use a proper emulation engine. If they would have done those things, this console would be a hit instead of the disaster it turned into. Increasing the games to 30 or 40 would have helped too, but that list is always going to be widely subjective. Whatever the list is, the games must run properly. To see Sony drop the ball on that part is very disappointing. It’s a PlayStation branded console. It should never have been released with this low quality of performance. Love Metal Gear Solid, Tekken & Resident Evil! Too bad the Tekken 3 & Resident Evil 1 they included are the slighty slower PAL versions.. Wish they put Tomb Raider & Silent Hill! Wow I can’t believe I’m saying this But this system is garbage!! Im glad I canceled my preorder I’m watching reviews on YouTube and it this thing is a mess, Sony how can you do this SMH! Hehe “youtube”. You might as well talk about what you’ve learned on Twitter and Tumblr too. Adsense trolls, clickbait artists, and attention seekers are not what I would call reliable sources. @TJ_Solo Digital Foundry: the ultimate troll, clickbait artist eh? Add new games later on USB or something! USB sticks with different packs of 5 new games or something like that, thatd be awesome! The early reviews for PS Classic were lower than Donny’s approval ratings. For some reason I foresee a stack of them in Target’s clearance section in a few weeks. If only PS Classics had been a bundle, retail and digital, for PS4, such respect for PS gamers would have brought profit for Sony and joy for us. Total garbage. The entire console smacks of a midyear rushed project where upper management green lite the PSO Classic at the 11th hour to get Xmas sales. 1. Announcing only half of the titles to begin with. No reason for this other than either licensing wasn’t finalized or verification of the games running well (or well enough) on the hardware wasn’t done. In either case it shouldn’t have happened. 2. Using open source emulators and leaving features off that would have helped with the graphics performance. You have been doing a form of emulation in one form or another since the PS2. You simply cut corners in used a open source emulator so you wouldn’t have to actually put any work into an honest-to-god emulation that came out of house. 3. No rumors of this until a week or two before the announcement. This is unheard of nowadays. 4. Crappy UI and missing core features like instant saves beyond a single slot. 5. Middle of the road, at best, game lineup. of the top end maybe holds up despite dated polygon era is tekken 3 I cannot get on psn for ps3 or vita I have, you put the 50frames version here. I had original psx version and played in arcade in Canada. As someone that doesn’t pirate games, has been playing all sony products since psx launch with my brother this is a huge miss. the game selection is locked in and very poor. Of the best games here only ff7 is ok with the setup as is, metal gear is much better with a proper dual shock. Very poor game choices licencing or no, you would have been better selling with one controller at $80 cad as it stands. The worst thing is many sony first party / published games are missing. It’s a bad look. And ultimately not classic at all, not in the least. the 9 pal mars the decent to good ones as well. I am perplexed that you chose a stock emulator, bare bones, controllers that feel off, titles like rainbow six and the like. It’s my birthday and even that can’t make me justify this or want to get it as a gift. Who exactly is this product for Sony? as far as I can tell it’s a quick lame duck holiday cash grab, and it’s unfortunate as you have had some really excellent games / products this year. This is not one of them however. for those that want a real look at all of the games and an honest assessment check out giant bombs video on youtube on this it’s 2 and a half hours and they actually played this back in the mid 90’s like myself. Unlike the phony evangelists out there. Respect to Sid trying to make the best of this but this is not an acceptable product to actually play. This console is super disappointing, whose idea is it to add rainbow six, 2D rayman and 2D gta in this machine rather than tomb raider, gran turismo, castlevania sotn, soul reaver, etc? My psvita is a better psone classic than this. I’m still kinda flabbergasted that this is a whole new system and not just a PSTV in a different form factor. Please wait until we’ve liberated the rest of your PSN before you go out of business, K? The PAL version of Tekken 3 is an atrocity. I cancelled my preorder when I saw 9 pal games on a NA console. Lets be honest here, this is here to cash grab and nothing more. Zero thought went into this and worse of all it has no heart. Nintendo did it right twice, this is a total fail and I feel sorry for the ones who feel its their duty to buy this garbage…! I too cancelled my preorder. Yes, zero thought went into this on the software side, which is the most important aspect. But, that said, the hardware team did put some thought into this, and they nailed it. The console looks fantastic and is an excellent recreation of the PS1. Sadly, like you, that was not enough for me in the end. I simply cannot pay $99 for the shambolic software Sony put into this product (not necessarily the game selection….the horrendous emulation, PAL games, etc.). I still can’t believe they put PAL games into this product. It’s just absurd. When are these games coming to PlayStation 4? I would gladly pay $200, or $9.99 a pop to play these in 4K/60 on my PS4 Pro, with Trophy Support as the Cherry on top. As it stands I wouldn’t even buy this PS Classic at $50. It is just a terrible product every way you look at it. For now I will continue enjoying PS1 Classics on my 3G PS Vita, PSTV, and PS3. I just hope I won’t still be stuck playing on these ageing platforms as we move to 5G in Mobile and 8K at Home. Iwant to be playing PS1 games on my PlayStation 5 and PlayStation Phone 5 years from now. Instead of rebuying them at a higher price, I would much rather see support for the PSOne Classics some of us already bought (and continue to buy). None! I am ONLY waiting SOCOM 2 Remastered game. Sad to say, but I cancelled my pre-order. I am a huge PlayStation fan, and I’d have kept the order under most circumstances, but once I saw the reports of horrid performance and PAL versions being included. It was just a deal breaker for me. Honestly, you have to screw up pretty bad to get me not to buy something like this. Sadly, that’s what happened. MAYBE I’d consider sticking with it if it were $49 or $59. But at $99? Simply couldn’t do it. This could have been AWESOME and by all rights should have been. But instead, here we are with a VERY disappointing product. I was in Electronics Boutique on 9.9.95 and have been there every step of the way since. As a fan of every PS system I feel this product tarnishes the memory of the originals greatness. PlayStation, you’re better than this. Sigh. Sony should be ashamed of themselves for this product and how they are promoting it. I just noticed that on the home page of this blog in the top banner section, they posted an old entry (Oct. 29) instead of this one. Why? The old blog is closed and most comments are positive since they were made before the failure of PS Classic was fully unveiled.